The Phoenix Scorpion Season changes every year depending on the weather. Normally scorpion season starts as early as March, but it’s in full swing when night temperatures rise above 70°. HOWEVER… We’ve been seeing higher scorpion issues this year so far, AND night temperatures haven’t gotten up to 70° yet! Scorpions stay very active through October until night temps drop back down under 70°. 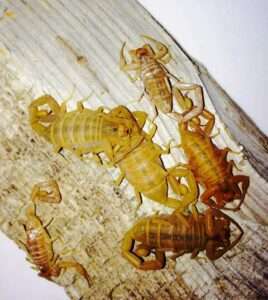 Arizona Bark Scorpions, and other scorpion species, live ALL year LONG in Phoenix Valley neighborhoods & desert areas. Scorpion problems are less noticeable but don’t end during the winter. If you see scorpions during cooler months, you may have bark scorpions nesting close by. Valley temperatures got COLD (for the Phoenix Valley) this winter, and bark scorpions are nesting or hibernating till it starts warming up. Prevent scorpions from nesting around your home and yard! If you haven’t had your home & yard treated NOW is the time to start scorpion control! During the winter Bark Scorpions GATHER to nest in large GROUPS! We all LOVE the mild winter temperatures in the Phoenix Valley, and so do scorpions. Hot summers and mild winters allow scorpions to THRIVE throughout Phoenix and Mesa AZ Valley areas. Arizona Bark Scorpions gather to nest or hibernate for the winter when nighttime temperatures drop under 70° which usually happens in October. Arizona bark scorpion nests are large and contain up to 30 scorpions… They’re like a ticking scorpion bombs that will explode in the spring. Seeing Scorpions During the Winter? Most scorpions are NOT active during cold weather. If you see scorpions in your home or yard during the winter or from late October – early March, you most likely have a scorpion nest close by. 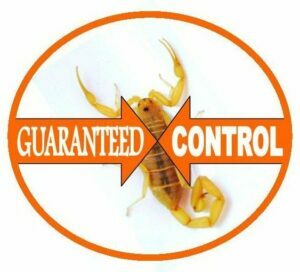 Prevent scorpion infestations BEFORE they start with monthly scorpion control service! Don’t wait till you find a scorpion inside your home to have it treated. Scorpions can continue entering your home or yard from the desert, untreated neighboring properties, block wall fences, drainage areas and community greenbelts. Control and PREVENT scorpion infestations with monthly scorpion control services that keep an active barrier around your home and yard all year round. After your initial scorpion control treatment, scorpions and any other pests hiding out around your house, will come out into the open and die. As scorpions continue exiting cracks and crevices for a couple weeks they’ll contact our specialized product barrier and die within a couple hours. Scorpions that contact specialized products soon after treatment die with in an hour. After products have dried, scorpions take a couple hours to die after exposure. We had a scorpion problem for years and Responsible took care of it in a single visit. Scorpion season starting up again and just had them out for a maintenance spray. Our technician, David, shows up when scheduled, is courteous, and conducts business in a professional manner. Responsible Pest Control specializes in effective scorpion control services with RESPONSIBLE methods for the safety of children and pets! Providing the people, products and process to KEEP scorpions and other pests OUT of your home and yard. Scorpions from surrounding areas like the desert, green belts, and neighboring properties can still enter your yard, BUT after coming into contact with our specialized treatment barrier those scorpions, and other bugs, become slow and sluggish then die. The dying process for scorpions can take an hour or two after products have dried. IF you SEE SCORPIONS while on our monthly scorpion control service they will be DEAD, or slow and DYING ~ GUARANTEED! I’ve had a scorpion problem for the 10 years that I’ve been in my North Phoenix home. I’ve tried several companies over the years and saw little difference. This season, I tired Responsible Pest Control and saw an amazing difference in the number of scorpions inside and outside my home. I check outside with a blacklight every night and was finding 4-5 each night. By the 2nd Responsible Pest Control treatment, I wasn’t finding any. What I did find was many during the day outside either dead or dying. I also found a few dead ones in the house. By the end of summer 2016, the problem is virtually gone. This company has EXCELLENT customer service and does a fantastic job of communicating to me. Bottom line is that their treatments are affordable and they work. I couldn’t be happier with my decision to use Responsible Pest Control. Kevin W. – North Phoenix. Delivering EFFECTIVE Scorpion Pest Control in Mesa, Phoenix, Scottsdale, Chandler, Gilbert, Glendale, Queen Creek, San Tan Valley, Maricopa, Tucson AZ and surrounding areas!